With the jubilee celebration over, the regular routine of school re-established itself in late 1905 and early 1906. The Jesuits even considered moving the high school portion of the school to some available land west of Fillmore Street, or even to Millbrae, and making St. Ignatius College into a university. (In the Consultors’ minutes from September 6, 1904, preserved in the Province Archive Room, mention is made that “the advisors think entirely that the high school must be removed, and they propose that now a piece of land be purchased near the city [of] San Francisco, for example, near Millbrae.” Two days later, the minutes indicate that “the Superior has read what actions there were in discussion of SI College regarding the proposed high school…. The advisors of this mission praise the actions and the deeds.”) In addition, the college considered adding a law school and medical school and offering degrees in those fields. Mother Earth had other plans for the school. At 5:13 a.m. on the morning of April 18, 1906, three days after Easter Sunday, a fearsome earthquake shook much of the state for 48 seconds and ignited a four-day firestorm that destroyed much of the city. The disaster caused $500 million in damage (more than $8 billion in today’s dollars.) Though accounts at the time put the death toll at just under 700, more than 3,000 people lost their lives in the conflagration, many trapped in tenements that collapsed when the ground beneath them liquefied. “The time was near the hour of sunrise — 5:13 in the morning, Wednesday, the 18th of April. Stillness hovered over the great city…. Everybody at St. Ignatius was astir. Rising at 5 o’clock [the traditional hour for Jesuits in residence to arise], we were engaged in making our toilet. Slight and short earthquakes, of one to five seconds duration, are not a rare occurrence in San Francisco. Half a dozen per annum, or even twice that number, would not startle the average Californian. The practice on such occasions is to cross oneself, and say a short prayer — a couple of seconds, and all would be over. I must admit, however, that I always felt relieved when the earth was once more quiet, in its normal steadiness. “And so that morning, thirteen minutes after five, when the first indications of the earthquake appeared, I crossed myself, made the wonted aspirations, and continued dressing. But in a few seconds I felt that the quake was sharper than any I had yet experienced. Lo, half clad as I was, I dropped on my knees, at the foot of my bed, and prayed. Then came that crashing, rumbling intonation, so strangely awful and so terrible that it baffles the power of description — none can comprehend it save those who have experienced it. Yet it was but the herald of the terrific convulsion that followed. The great strata of rock and conglomerate that form the peninsula on which San Francisco stands rotated, tilted, twisted, sank and heaved in veriest agony. The massive buildings of St. Ignatius seemed like a piece of shrubbery in an autumn storm. “Meanwhile I was on my knees, making acts of the love of God and of perfect contrition. ‘The end has come,’ I said to myself; ‘in one short minute I shall stand before the judgment seat of God; every second counts: I must be ready.’ Never in my life have I prayed as I did on that occasion. In the past I had visited so many sanctuaries dear to every Catholic and especially to every Jesuit … but nowhere did I pray as I did during the forty-eight seconds of the San Francisco earthquake. To this day I have comfort in the thought that when the crucial moment seemed at hand, I turned to God with all the power of my soul, with my entire being; I turned to Him alone. It was the outcome of the faith that is in you and me; and — be it said in humble thankfulness — God’s grace dispelled all terror at having to appear before my Judge. “But Divine Providence had disposed otherwise. As abruptly as the earthquake came, so it ceased. The troubled ground resumed its normal shape and equilibrium. ‘Peace, be still.’ The mandate had come from heaven; it was obeyed. No chronicler, nor storyteller, can describe with anything like accuracy the workings of the human mind during that fearful suspense of forty-eight seconds. None but the Almighty can tabulate the agonizing prayers that went up to heaven from so many souls, whose faith bade them turn with all the energy of their beings to Him who alone can guard and ease. “When the earthquake had subsided, a party of Fathers and Scholastics went through the rooms to see if anyone was injured. Though several doors were jammed in their casings, and had to be forced open to release the occupant, no one had suffered any harm. All the inmates of the college were accounted for — twenty-one priests, nine scholastics, eleven brothers and seven servants. We were deeply grateful. In the building itself, every room and every corridor showed the confusion, while here and there appeared dangerous looking cracks several inches in width, and running some distance along the walls. The most serious damage was done in the large auditorium, located on the upper story of the college building: the top of the façade had fallen. “Little or no harm had been done to the church. The towers were intact, the organ in its place. But statues had fallen; and the rich Easter decorations were piled in a heap of broken candelabra, candles, vases and flowers, literally strewing the ample sanctuary with wreckage. My heart was bleeding as I surveyed it all. It was but the beginning of our trials — worse was coming. “Hundreds of people, men and women, stunned with terror, not knowing what might follow, poured into the church to seek shelter from their very fears — shelter with Him who loved them as His children and who would provide. Every confessional was besieged — all dreaded a repetition of the shock, they wanted to prepare for the worst. Hurriedly we cleared away the debris from the altar, and by 6 o’clock we could begin the Holy Sacrifice. The communion rail was filled again and again at each of the four Masses celebrated at the Main Altar that morning. It was a solemn and distressingly pathetic sight. How I could stand the intenseness of the strain I know not. Panic in every face at the railing, tears in every eye as the Blessed Lord came to give Himself to His own, faith through it all — you could feel it, and deep devotion pictured everywhere. “Meanwhile an emergency hospital had been established in the ‘Mechanics Pavilion’ — a large armory in the neighborhood of the college. Soon it was filled with wounded and dying men and women. And the cry came for priests. Eight of the Fathers were at once detailed to minister the consolations of religion to the many who were so near their final reckoning. Demands for priestly help came from other quarters as well — in each case I supplied the need. Several of the Fathers were still engaged in their work of zealous charity — in hospitals and in the very street — when their own home at St. Ignatius was nearing its destruction. “At an early hour, fire had broken out in the eastern part of the city. And into a dense cloud, the truth flashed upon us that the fire department was paralyzed — there was no water. Only a few hundred feet away reposed three fourths of all the water on the surface of the globe; we were powerless to use it. The mains had been broken by the convulsions of the earthquake, and now the horrors of a conflagration would be added to the ruins wrought in the early morning. At the College, however, we had every reason for feeling secure. The fire was a mile and more away, the wind blew from west to east, besides we were separated from the threatened section of the city by an avenue, Van Ness, 120 feet in width. But the danger came quickly, suddenly, from an unexpected quarter. Frieden and several other Jesuits went to the Holy Family Convent on Fillmore Street, which they hoped would be spared the fire. He asked two men to carry the satchels of documents while he carried the Eucharist in its ciborium. As the group walked toward the convent, they passed Catholics who recognized the Blessed Sacrament and either bowed their heads or genuflected as Frieden walked by them. From their lookout at the Holy Family Convent at 890 Hayes Street, the Jesuits saw the city in flames. Fr. Henry Whittle, SJ, later wrote in his diary that “the city seems a sea of fire.” With most of the city residents afraid to re-enter the buildings, and with soldiers shooting looters on sight, the city seemed like a scene from Dante’s Inferno. But on the fourth day, the fires finally died out. Fr. Jerome S. Ricard, SJ, a Jesuit at Santa Clara College (where he was known as “Padre of the Rains” for his weather predictions and where he ran the observatory), wrote this to the San Jose Mercuryon April 22, 1906: “The earthquake period is gone. Once the pent up forces of nature have had a vent, nothing of a serious nature need be apprehended. At the most a succession of minor shocks may be felt and that’s all. It is unreasonable, therefore, for people to continue in dread of a new destructive trembler. People should fearlessly go to work and repair mischief done and sleep quietly at night anywhere at all, especially in wooden frame. Never mind foreboders of evil: They do not know what they are talking about. Seismonetry is in its infancy and those therefore who venture out with predictions of future earthquakes when the main shock has taken place ought to be arrested as disturbers of the peace.” Ironically, in the 1940s, one Jesuit priest, Fr. Alexis Mei, SJ ’16, installed a seismograph in the basement of St. Ignatius Church, and it remained there until the 1960s recording the tremors that regularly jolted San Francisco over the years. In the end, the Jesuits of San Francisco lost their residence, their church, and their college, including the most comprehensive ornithological collection west of the Mississippi, science laboratories that rivaled any in the country and the beautiful art that adorned the church. Miraculously, no one at SI died in the earthquake and fire — not one of the 44 Jesuits or teachers or students, though some suffered injury.5 With an indomitable spirit, the Jesuits went about rebuilding their home, their church and their school for the sake of their students and for the greater glory of God. 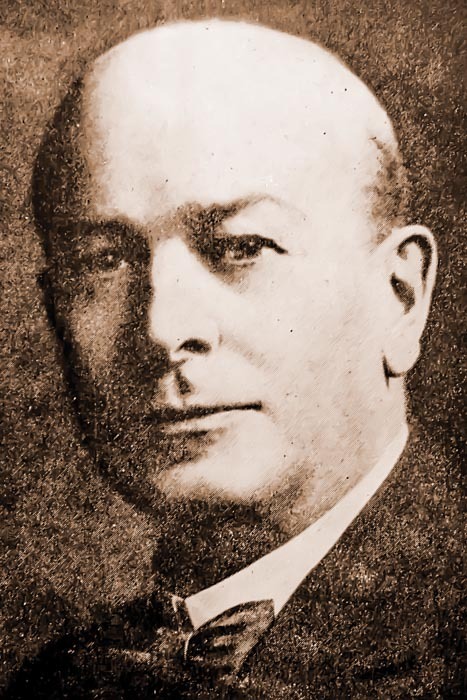 Frank Drum’s early investment helped PG&E form, and he served as the utility’s president between 1907 and 1920. The Colfax Record wrote about Drum in Sept. 5, 2012. Colfax, just east of Auburn on Interstate 80, has a Drum Forebay freeway exit and a Drum Powerhouse (pictured above), named for Frank. The story and photos are reprinted with permission of the paper. Thousands of motorists see it daily, just north of Baxter on Interstate 80: the Drum Forebay exit. Then there’s Drum Powerhouse on the south side of the Bear River in Alta. But that’s not all; the massive company known as Pacific Gas and Electric, with its more than 20,000 employees, has the Drum Division. The latter basically comprises the Placer County core of the company’s local operations. So who was Drum? Frank G. Drum grew up in Oakland and attended St. Ignatius College. After his 1881 graduation, he became a member of a surveying party laying out new rail lines in the state of Nevada. Early on he showed a drive and developed a reputation as someone who gets things done. He joined the offices of Haggin and Tevis in San Francisco as a property manager. His skills grew and he became the company’s principal adviser overseeing properties that included the Kern County Land Company and various corporations with vast acreages in New Mexico, Arizona, Oregon and California. In 1903, Drum partnered with a group of pioneering hydroelectric developers in a public utility enterprise shortly after Eugene DeSabla, John Martin and R.R. Colgate put together a merger of gas and electric properties to create the California Gas and Electric Corporation. The trio got off to a rough start, and they were teetering on the edge of failure when DeSabla went to the offices of Haggin and Tevis in the Mills building in San Francisco. His goal was to secure possible bond buyers to allay a financial collapse. However, instead of finding the company principals, he found Frank Drum minding the store. Drum listened to DeSabla’s presentation and asked, “How much do you need?” DeSabla thought for a moment and responded $200,000 — worth $5.25 million today. Drum took the set of drawings and the business plan and wrote his name across the cover, assuring the company that he was in for the full ride. Drum went on to lead a financial reconstruction of the company as a member of the firm’s executive committee and in 1907 was elected president, an office he held for 13 years. He resigned from that position because of ill health and the demands of his other business interests. He remained on the board as a director and member of the executive committee until his death on Aug. 28, 1928. Drum was a giant in the business world of that era of industry and growth. Britton called him a natural fighter and that he was most productive when cornered. Fitting to have a powerhouse named for him.